June 15 (The Daily Star) Prime Minister Sheikh Hasina will visit Mongolia on July 14-17 to attend the 11th summit of Asia-Europe Meeting (ASEM). Officials said the summit in the Mongolian capital Ulaanbaatar will provide an opportunity to the leaders of Asia and Europe to discuss regional and international issues. The PM is scheduled to attend the plenary sessions of the summit and deliver a speech on July 15-16. She is expected to hold bilateral meetings with several heads of state and government on the sidelines of the Summit. Foreign ministry officials have already received positive response from different countries on the bilateral meetings. They said the premier was planning to visit several other countries, including Germany, Bahrain and Venezuela, after Mongolia. Bangladesh had joined the 52-nation ASEM in 2012 to boost cooperation between Asia and Europe on political, economic and social issues. ASEM provides a unique platform to bring Europe and Asia closer on a number of issues of global importance, be it revival of economic growth worldwide, climate change, or the post-2015 development agenda. More than 5,000 delegates, including presidents of 15 countries, prime ministers and foreign ministers of 21 countries, and heads of international organisations as well as representatives of the media, are expected to join the 11th ASEM Summit. Ulan Bator, Jun 9 (Prensa Latina) The financial meeting of the Forum Asia-Europe started today its sessions in the Mongolian capital, pursuing stable economic growth for these regions. Reports of organizers added the venue also looks to improve connections between the two continents. Delegates of 43 of the 53 economies that make up the organization, as well as multilateral organizations like the International Monetary Fund, participate in the two-day meeting. Connections between Asia and Europe through infrastructure, but alsio exchange of investment and workforce, is another of the points that head the agenda of the meeting. During the first bilateral contacts emerged the intention to build efficient physical infrastructurem to make trade between Asian and European nations more fluent than at present. They also are looking at how to involve international financial institutions in such purposes. Authorities of Mongolia said that present improvement of connections will require the financial collaboration of the countries and international institutions. That allusion pointed to the Investment and Infrastructure Bank, the World Bank or the Asia Development Bank, which according to experts, could help ripen the infrastructure projects. June 12 (The Australian) Speculation just won't go away that Rio Tinto will move to better match its equity position in Mongolia's expanding Oyu Tolgoi copper/gold mine to its deep involvement and leadership of the nation-changing project. The latest chatter, courtesy of London's Sunday Times, is that Rio has hired Goldman Sachs as an adviser to look at a two-step wrap-up of the Vancouver-listed Turquoise Hill, owned 51 per cent by Rio. Turquoise Hill owns 66 per cent of Oyu Tolgoi (meaning Rio has a 33.66 per cent Oyu Tolgoi stake), with the Mongolian government owning the remaining 34 per cent. The Sunday Times is suggesting that Rio is looking to increase its stake in Turquoise Hill and have the rest of the company acquired by single strategic buyer or consortium. Both Rio and Goldmans declined to comment, as was the case the last time it was reported Goldmans had been hired to solve the Oyu Tolgoi conundrum. The time and effort spent by Rio on getting Oyu Tolgoi to the point where the operation's $US5.3 billion expansion underground can take place, along with its financial support along the way, makes it a no brainier that its indirect 33.66 per cent indirect exposure needs to become direct, and much larger. And despite Oyu Tolgoi's expansion underground making it the next best thing in the global mining space, the cost to Rio would not be particularly big. On Friday, Turquoise Hill was valued at all of $US5.8bn, valuing the outstanding 49 per cent at $US2.8bn, or $US3.6bn if a 30 per cent premium was to be added. Take the premium price and assume Rio would like to see a 30 per cent stake go off to The Sunday Times' strategic buyer, and the cost to Rio is a more than manageable $US1.4bn to take it up to a more meaningful 70 per cent of the 66 per cent mine stake, or 46.2 per cent of the action. The timing is good if Rio's previous call that first production in 2020 from the underground operation — it is where 80 per cent of the value is — will coincide with a structural deficit in global copper supplies can be relied on. Turquoise Hill benefited from the mid-January rally in prices and sentiment on commodity prices. Its market value has improved by 67 per cent since, so an earlier move by Rio would have been ideal. Then again, Turquoise Hill is still down by 30 per cent on its level of a year ago. June 14 (MONTSAME) The Government of Mongolia will own 10% of shares of Oyu Tolgoi copper concentrate smelting and refining plant without making any investments and payments. The state authority in the plant will be exercised by the Ministry of Industry. Thereby, a tender for selecting investor in the copper smelter and refinery will be organized in July of 2016. According to members of the cabinet, a 10 percent package shares obliges the Mongolian government to provide policy supervision and regulations, as well as favorable legal environment and sustainability for the operations of the plant. On the other hand it has a number of advantages such as attracting more investment to the copper smelting and refining industry, improving competitiveness, facilitating implementations of simultaneous projects on processing the by-products of copper plants or sulfuric acid, and on producing finished products from them and contributing in building chemical plants in Mongolia by promoting domestic consumption of sulfuric acid. June 14 -- Under Rio Tinto's plan to reduce gross debt as part of its ongoing capital management, Rio Tinto Finance (USA) plc and Rio Tinto Finance (USA) Limited have accepted for purchase a total of $1.747 billion in debt pursuant to their Any and All Offer, which commenced on 7 June 2016 and expired on 13 June 2016. $943 million in aggregate principal amount of 6.500 per cent Notes due 2018 will be purchased at a price of $1,108.33 per $1,000 principal amount of notes. $804 million in aggregate principal amount of 2.250 per cent Notes due 2018 will be purchased at a price of $1,024.36 per $1,000 principal amount of notes. The above amounts exclude $1 million of Any and All Securities that remain subject to the guaranteed delivery procedures described in the Offer to Purchase. The Any and All Securities purchased will be retired and cancelled and no longer remain outstanding. June 14 -- Wolf Petroleum Limited ASX:WOF (WOF or the Company) is pleased to announce that it has agreed terms for the funding of up to $3.2 million from China Sam Enterprise Group Co., Ltd (SAM Group). · the appointment of up to three SAM Group nominees to the board of WOF. Executive Chairman Matthew Wood, said "Securing SAM Group as a new cornerstone investor is a milestone development for Wolf and its shareholders. In this current downturn in the petroleum industry, well-funded investment groups such as SAM Group who know Mongolia and know the Wolf assets deciding to join Wolf is a vote of support in the work that the company has been doing for a number of years to develop our interests in these blocks." The Proposed Transaction will provide the Company with additional capital for the continual development of its petroleum exploration projects, the SB, Jinst and BU blocks. The Proposed Transaction will not result in a change in the nature of the Company's activities. SAM Group is committed to assisting WOF in the development of its existing projects, the SB, Jinst and BU blocks. SAM Group is not a related party of the Company. Set out below is the indicative capital structure of the Company following completion of the Proposed Transaction and associated capital raisings. The anticipated capital structure of the Company is only an estimate and is subject to variation. HALIFAX, NOVA SCOTIA--(Marketwired - June 14, 2016) - Erdene Resource Development Corp. (TSX:ERD) ("Erdene" or "Company"), is pleased to announce additional results from follow-up drilling on the recent high-grade discovery at the Company's 100%-owned Bayan Khundii Gold Project ("Bayan Khundii") in southwest Mongolia. Today's results are for the third batch of drill results (9 holes; 1,403 m) from the Company's Q2-2016 drill program. A fourth and final batch of results for the final five holes is expected to be released before the end of Q2-2016. Included with this release, for reference, are a plan map and three cross-sections. "Today's results confirm our stated objectives of confirming continuity of gold mineralization in the main zones, including the Striker Zone, and extending mineralization through reconnaissance drilling outside the previous known limits. The results confirm the extension of significant gold mineralization at depth in the Striker Zone, the identification of a new zone at surface and the discovery of broad zones of mineralization under cover," said Peter Akerley, President and CEO. "We will now dedicate additional resources to improving our understanding of the controls on mineralization in this large system prior to a return to drilling in mid third quarter." TORONTO, ON--(Marketwired - June 13, 2016) - Centerra Gold Inc. (TSX: CG) will host a conference call and webcast of its 2016 second quarter financial and operating results at 11:00AM Eastern time on Wednesday, July 27, 2016. The results are scheduled to be released after the market closes on Tuesday, July 26, 2016. June 14 (MSE) Based on No. : 45 of the enforcement letter from state inspector of Financial Regulatory Commission dated 13 June 2016, trading of "SUU" JSC halted temporary. In the enforcement letter, decision of 1,000 for 1 stock split action made on "SUU" JSC, that has total 344,000 outstanding shares with nominal price of MNT100.00 resulted total of 344,000,000 outstanding shares with MNT0.10 nominal price were stated. 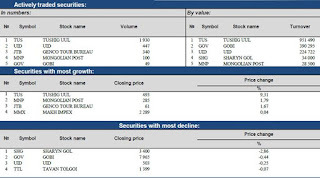 The trading of "SUU" JSC halted temporary starting from 13 June 2016, and Mongolian Stock Exchange have an assignment to execute it within 5 working days. June 14 (MSE) Based on No. : 44 of the enforcement letter from state inspector of Financial Regulatory Commission dated 13 June 2016, trading of "APU" JSC halted temporary. In the enforcement letter, decision of 10 for 1 stock split action made on "APU" JSC, that has total 74,287,700 outstanding shares with nominal price of MNT100.00 resulted total of 742,877,000 outstanding shares with MNT10.00 nominal price were stated. The trading of "APU" JSC halted temporary starting from 13 June 2016, and Mongolian Stock Exchange have an assignment to execute it within 5 working days. 1. Spot trade: Commercial banks bid MNT1955.00-1970.00 for USD2.9 million, asked MNT 1967.18-1969.18 for USD 3.0 million and bid MNT299.20 for CNY0.7 million respectively. The BOM did not accept any offers. 2. Swap and forward trade: The BOM accepted the bid offers of USD 146.5 million of MNT swap agreement and bid offers of USD5.0 million of USD swap agreement from commercial banks. The BOM accepted all of the bid offers. June 13 (Bloomberg) -- Mongolia's total equilibrated revenue and grants to the general govt budget in January-May were 2.09tr tugrik compared with total expenditure of 3tr tugrik, leaving a budget deficit of 877b tugrik ($445.2m), according to National Statistical Office release. June 13 (Bloomberg) -- Mongolia gold exports rose to 5.2 tons in 1st 5 months of yr from 3.4 tons a yr earlier, statistics office says on website. 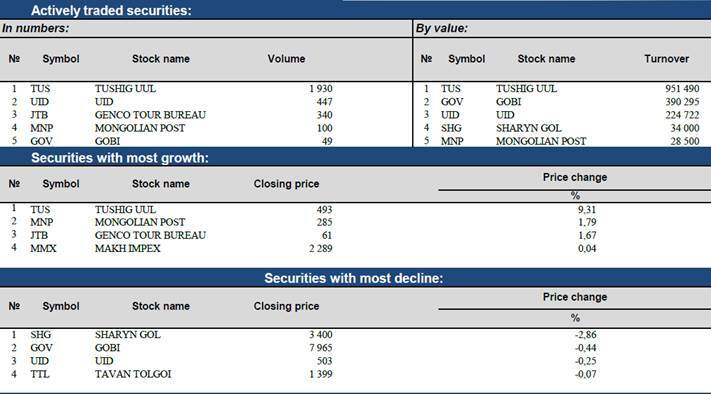 June 14 (news.mn) Last week, the Government decided to buy 30% of the public shares in the "Erdenes Tavan Tolgoi" stock company; the value of the shares is MNT 300,000 each. From Monday 13th June, the commercial banks have begun receiving application documents from Mongolian citizens wishing to sell their shares. The money will be transferred in three installments of MNT 100,000 each. The first transfer to the accounts of the members of the public is due to take place a week after the application documents have been received. It should be noted that 2,858,000 citizen own shares at Erdenes Tavan Tolgoi stock company. Members of the public are now free to sell their shares, whenever they want. June 14 (news.mn) Canvasing for the forthcoming election started officially on 11th June. In accordance with the Electoral Law, candidates can use street advertising signs hung on the light poles and the walls of campaign offices without using glue or adhesive materials. Candidates are also A-frame street-level signs as well as signs on steel frames supported by a light pole. Within two days of the electoral advertising program starting, there have been various cases of officially-registered signs being torn down or vandalized. Subsequently, the police authority has issued a statement that it intends to identify the people who have done this. Anyone caught will receive a harsh fine equivalent to between six and eight times the minimum wage; in money terms this is MNT 1,152,000-1,536,000. June 10 (World Politics Review) When a country's economy is doing poorly and voters are suffering, a government can expect to be voted out of office on election day. So Mongolia's upcoming parliamentary elections June 29 could see a staggering defeat for the ruling Democratic Party (DP), which has led successive governments over the past four years. This is not lost on DP officials. Yet rather than offer a compelling vision for Mongolia's future, their campaign strategy has focused on reconfiguring the entire election system, creating more problems in the process. 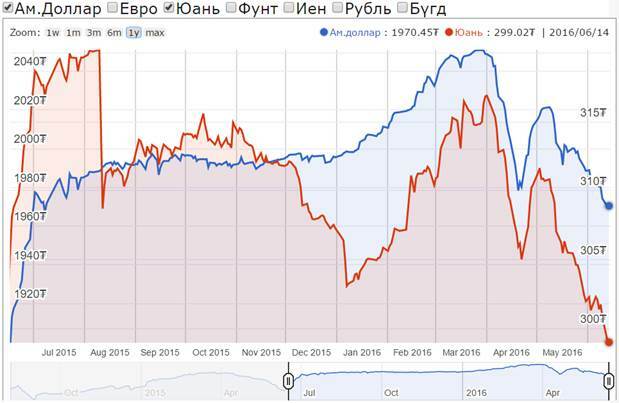 Two factors have combined to depress the Mongolian economy: world commodity prices and domestic political choices. No mining economy has been spared the impact of the global slump in commodity prices that is linked to a slowing down of the Chinese economy. 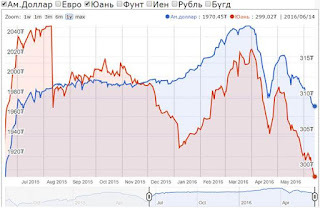 Given Mongolia's dependency on China's purchases, this downturn has been particularly acute. Worse, over the past several years, it was primarily new coal deposits that were set to be exploited, just as coal declined in significance on the back of measures to deal with climate change. Mongolia, like every other resource economy, might have prepared more diligently for this downturn. Yet decisions by the Mongolian government, both under the leadership of the DP and under its predecessors, have significantly worsened the economic impact. Before the 2012 election that brought the DP to power, a series of decisions were made by the then-governing Mongolian People's Party (MPP) to regulate foreign investment. That gave Mongolia the reputation of being inhospitable to foreign investors, which drove away most foreign direct investment. Add to this the decision to take on significant foreign debt with the issuance of so-called Chinggis Bonds in late 2012 under the then-newly elected DP-led coalition government, and the Mongolian government has left itself very little monetary or fiscal wriggle room to deal with its current economic woes. These two factors have combined to cause a downturn in GDP growth from 12.4 percent in 2012—the last parliamentary election—to forecasts of 7.9 percent in 2014, 2.3 percent in 2015, and just 0.8 percent this year. The relatively high rates of inflation over this period have combined with the decline of Mongolia's currency, the tugrik, to lead to job losses, unemployment and poverty. This trend is a reversal from the years leading up to 2012, when GDP growth, driven largely by the commodities boom, was strong enough to vault Mongolia into the rank of upper middle-income countries. Until there is a significant upturn in world commodity prices, the current economic woes are likely to continue through the presidential election in June 2017, when President Elbegdorj Tsakhia's second and final term is up. Given that Mongolians continue to identify the bad state of the economy and their concerns about unemployment as the most pressing policy issues in polling, it is difficult to imagine an election, whether this month's parliamentary polls or next year's presidential race, where the economic performance of DP-led governments will not be front and center. It is not only the economic performance of the past four years that suggests that voters might take the DP to task. The past four years have also seen some significant turmoil in the DP's governing coalition and among members of the Cabinet. In this, the DP government has mimicked the Democratic Union governments in power from 1996 to 2000. The Democratic Union had been formed out of various constituent elements of the democracy movement that brought about the Mongolian Revolution of 1990. In 2000, these elements united in the Democratic Party, but they have maintained their identity as factions within that party. It has been difficult to understand these factional rivalries at times, especially because some internecine battles have been clearly to the detriment of the DP and the Mongolian government. Prime Minister Altankhuyag Norov's government fell in 2014, for instance, largely because of factional struggles within the party. Until there is a significant upturn in world commodity prices, the current economic woes are likely to continue through the presidential election in June 2017. DP stalwarts of the democratic revolution like Elbegdorj, but also Ulaanbaatar's mayor, Erdeniin Bat-Uul, continue to dominate the party, along with other factional heads such as the speaker of parliament, Zandaakhuu Enkhbold. Much of this DP old guard is set to run again in this month's election, fueling some frustration among Mongolian voters who feel that there are few attractive choices and alternatives. Meanwhile, although an amended electoral law that handicaps smaller parties has grabbed headlines, debates about the election system are nothing new in Mongolia. The last three parliamentary elections—in 2004, 2008 and 2012—have all been run in different ways. This month's election looks set to return to the 2004 system of 76 directly elected, first-past-the-post constituencies, after a high court ruled that proportional representation, which was partially introduced in 2012, was unconstitutional. It does not take much imagination to recognize that majoritarian elections favor large parties and incumbents. Therefore, this electoral shift seems like an attempt by the DP—and perhaps to a lesser extent the MPP, which looks set to move out of the opposition and back into government—to maintain its share of power in Mongolia's parliament, known as the State Great Khural. Other measures have reinforced this impression. The official campaign period ahead of election day on June 29 has ostensibly been shortened to 18 days, starting June 11, in order to reduce the amount of spending by candidates and theoretically make it easier for smaller candidates to enter the election. It is not clear that that will be the effect, however. A shorter campaign period would seem to represent a clear benefit to better-known incumbents, especially when coupled with majoritarian voting. This is especially the case since candidates are not allowed to appear publicly in their constituencies prior to the beginning of the campaign, though incumbents are much less restricted in this regard. It is also no surprise that the DP-appointed General Election Commission is addressing administrative shortcomings in party and candidate registration by ruling such candidacies out. This seems to have removed the upstart XUN Party from the ballot already, and is likely to exclude former president—and convicted money launderer—Nambaryn Enkhbayar, as well. Where does this leave the actual content of parties' campaign platforms? In truth, the substance of political discourse ahead of the election seems to be outweighed by manipulations of the political process. So far, no political parties have announced any major policy initiatives that would see departures from the current government. Since candidates are legally bound to their party's platform in campaigning, it is unlikely that the campaign will hold any major surprises. Mongolians have grown critical of their political institutions while remaining committed to democracy in the abstract. As the country prepares for this election campaign, there is little on the horizon likely to inspire voters in their political institutions—and much to be cynical about. Some of that cynicism may express itself in lower-than-expected voter turnout; it even seems possible that some constituencies will not see the minimum 50 percent voting rates stipulated in the election law. While the new government is likely to be led by the MPP, the lack of policy differences between the large party platforms suggests that the biggest question is not whether policies, economic or otherwise, will shift. Instead, it is whether the MPP will forego an opportunity for yet another wholesale replacement of public servants, and whether anti-corruption efforts will continue to be politicized. Those factors will likely have a significant impact on Mongolians' confidence in democracy, shaping the country for years to come. Julian Dierkes is associate professor and Keidanren Chair in Japanese Research at the University of British Columbia. Follow him @jdierkes and read more of his analyses of contemporary Mongolia at mongoliafocus.com. June 10 (Mongolia Focus) The official campaign for the June 29 parliamentary election is kicking off on June 11. The General Election Commission published the official list of candidates on June 7. I've been trying to sort through this list to take note of particular interesting races and to get an overview of the political landscape. Below are some numbers. I suspect that I will keep updating this post or re-posting it as I notice or am told about more patterns. Ulaanbaatar, June 14 (MONTSAME) Secretary-General of the Parliament Office B.Boldbaatar received the World Bank Governance Program expert Ms Elin Bergman and her accompanying delegation on June 14. The World Bank has agreed to complete a review on Mongolia's regulatory policy and its delivery, at the request of the Cabinet Secretariat of the Government of Mongolia. On the motives that some advancements have been achieved in the regulatory policy and key laws of Mongolia, the World Bank concluded that a diagnostic tool can be utilized in Mongolia, noted Ms Bergman. As a follow-up of this review, a report and recommendations will be issued by the Wold Bank. The WB team is holding meetings on exchanging opinions on Law on Legal Documents and other major laws, their implementation preparation works and potential problems expected during law implementation. Ms Elin Bergman asked what effect the implementation of Law on Legal Documents has on the activities of the Parliament Office. Mr B.Boldbaatar replied that the law aims to make actual progress in implementation and delivery of laws and regulations. At this meeting, the sides further discussed about the review, as well as the Law on Public Hearing and the quality and delivery of General administrative laws. Ulaanbaatar, June 14 (MONTSAME) A ceremony took place on Tuesday at the UN House in Ulaanbaatar to launch the sixth Mongolia National Human Development Report entitled "Building a Better Tomorrow: Including Youth in the Development of Mongolia". This National Human Development Report (NHDR) of Mongolia--the sixth in the series--focuses on youth. Through the medium of the human development approach, it analyses the opportunities, choices and challenges facing young people in Mongolia today. This approach places people at the centre of development. It concentrates on enlarging people's opportunities and choices to live long, healthy and productive lives. UN Resident Coordinator and UNDP Resident Representative Beate Trankmann addressed the event, while she said: "Since the introduction of the concept in the first Human Development Report in 1990, human development has been about expanding the richness of human life, rather than simply the richness of economies. This idea focuses on people, and explores the opportunities people have to live the lives they choose. The Human Development Index (HDI) is a composite index of life expectancy, education, and income per capita indicators. Mongolia has done well on many of the health and education related Millennium Development Goals and this is reflected in commensurate improvements in the HDI,"
"Last year, it entered for the first time into the high human development category having passed the 0.7 threshold on the HDI. Out of 188 countries, it is currently placed in 90th position, alongside China. Since 2000, Mongolia improved its HDI by an annual 1.35%, moving quicker than most of the countries ranked above it,"
"Mongolia is a young country. Accounting for over a third of the population, youth aged 15–34 years represent the largest demographic group in Mongolia, and a significant share of working age people. Even by 2040, when the country's population is expected to reach 4 million, almost 30 percent will still be young. That is why this 6th National Human Development Report for Mongolia zooms in on young men and women aged 15-34 years old," she said in her speech. A key overriding message of this report is the contribution of youth to building a better tomorrow in Mongolia. This contribution depends largely on the capabilities and opportunities open to youth in making choices. Young people are the shapers and leaders of our global future.1 Like young people elsewhere, Mongolia's youth possess the potential to become the drivers of change and play a significant role in the nation's future. They are the first generation in the country to have spent most of their lives under a democratic form of government. This has been crucial to their outlook and their experience. At more than one million, youth aged 15–34 years represent the largest demographic group in Mongolia, accounting for 34.9 percent of the resident population in 2015 and a significant share of the people of working age. Even by 2040, when the country's population is expected to reach 4 million, an estimated 29 percent will be in the 15–34 age-group. The annual growth in gross domestic product (GDP) of Mongolia increased to 6.7 percent in 2005–2010 and then accelerated to 12.2 percent in 2010–2014. However, according to the World Bank, the growth in GDP is projected to have slowed to 2.3 percent in 2015 and to 0.8 percent in 2016 because of a sharp contraction in mining production and despite a gradual recovery in non-mining sectors.2 Nearly one person in five is living below the poverty line, and the regional disparities within the country are visible. Nonetheless, Mongolia has made substantial progress in the human development index (HDI) at the national level and is placed in the high human development category. Over the past two decades, Mongolia has evolved into "a vibrant multiparty democracy with a booming economy", and it is now "at the threshold of a major trans-formation driven by the exploitation of its vast mineral resources". To what extent are youth in Mongolia benefiting from the economic growth, the progress in social development and the other opportunities? What challenges are they facing in making the choice to "achieve outcomes that they value and have reason to value"? What policies are in place to address these challenges? What can be done by stakeholders to include youth in the country's growth and development? These are some of the questions motivating this NHDR, which analyses the issues around four pillars of human development important to youth: developing capabilities, expanding employment opportunities, empowering youth, and enhancing human security. In addition to the milk and meat, wool fibre now promises to be a money spinner as the fashion industry warms to it. Arkhangai, Mongolia, June 12 (Al Jazeera) - Yaks have roamed Mongolia's highlands for centuries. They have long been reared in Central Asia for their milk and meat. But herders in Mongolia discovered that the yaks' soft woolly undercoat - which they shed every spring - might be a money spinner. "We started collecting yak fibre in 2010. We have been selling the yak fibre directly to our cooperative, and this has had a very good influence on our lives," Nyambuu-nyadmaa, a yak herder, told Al Jazeera. The yak herders' cooperative sells the wool to factories in Europe with the help of a French nonprofit organisation that also trains them to spin and sell their hand-spun yarn at home and abroad. The fashion industry is also warming to yak fibre. At the Paris Fashion Week, Aruinaa Suri, a fashion designer known for her cashmere, leather and felt designs, realised it was her new line of yak wool garments that got the most attention. "There were people who were touching yak wool fibre for the first time," Suri said. "They found it really interesting. It was almost as if they liked this material the most." With growing interest in the fibre and the new income opportunity it holds, yaks continue to be an important part of the landscape here. June 14 (gogo.mn) Mongol Naadam festival which became the expression of Mongolian traditional custom and culture is approaching. Gobi JSC is introducing new deels designs combined the both traditional and modern styles which are perfect for the summer. Moreover, they offer new printed shawls. June 13 (SeeNews) - The European Bank for Reconstruction and Development (EBRD) is looking at providing a senior secured loan of up to USD 25 million (EUR 22.2m) to finance a 50-MW solar park in Mongolia. Clean Energy Asia LLC's Tsetsii project, worth USD 120 million, is located in the Tsogttsetsii soum of Umnugovi aimag, the southern parts of the Gobi desert. EBRD will co-finance the project alongside the Japan International Cooperation Agency (JICA). In addition, the Japanese government will allocate a USD-746,125 grant under its Japan-EBRD Cooperation Fund for the upgrade of state-owned National Transmission Power Grid (NPTG) company's existing Tavan Tolgoi substation. The borrower is a special purpose company, in which domestic telecommunications, property and energy conglomerate Newcom Group hold a 51% stake. The remaining 49% is owned by SB Energy Corp -- the renewables arm of Japanese telecommunications and technology major SoftBank Group Corp. The plant will help diversify Mongolia's coal-dependent power sector while offsetting as much as 230,000 tonnes of carbon dioxide (CO2) emissions annually. Ulaanbaatar, June 14 (MONTSAME) Three years have passed since the APU Company started producing Kaltenberg, one of the best Bavarian yeast brewery brands. On the occasion of the 500th anniversary of "German Beer Purity Law", the Prince Luitpold of Bavaria has visited Mongolia, to attend the celebration here. On 23 April 1516, the Duke of Bavaria Wilhelm IV issued his famous purity regulation for the brewing of Bavarian Beer, stating that only barley, hops, and water could be used. To acknowledge the production of purely brewed Kaltenberg by APU Company, the first and only in Asia, the lawful heir of the purity law initiator Prince Luitpold took part in the celebration, which has been held at Ikh Mongol bar. APU Company has been pursuing the purity law and the German technology in the productions of most of its beers. Kaltenberg beer has gotten its name from the famous Kaltenberg castle, which remains as the center of royal brewery of Bavaria. Family of Prince Luitpold of Bavaria is the current owner of the Kaltenberg brewing factory, inheriting and maintaining the purity of the classic brewery even after the decline of Kingdom of Bavaria after the World War I.
Ulaanbaatar, June 14 (MONTSAME) Over 100 Mongolian nationals, who live in Canada and USA, has gathered in Toronto to take part in the "Business Abroad: Environment and Practices" meeting. The third meeting under such a topic was organized on June 5 by the Mongolian Ministry of Foreign Affairs, Tsakhim Ortoo NGO, Council of Mongolians Abroad, Association of Mongolians in the UK, Canada Mongolia Chamber of Commerce and the Mongolian Embassy to Canada. Mongolian Embassy officials made detailed introduction to Mongolian government's policy on promoting Mongolia abroad, encouraging the activities of organizations and unions of Mongolian nationals overseas, and providing guidance for them. In the margin of these objectives, the cabinet has approved "World Mongolians" program at its first this year meeting, informed the embassy. The officials also highlighted that the Embassy have been attaching greater importance to protecting the interests and rights of Mongolian citizens working and studying in Canada, and exchanged views on this matter with the gathered. Also, the head of Council of Mongolians Abroad B.Enkhtuvshin and the head of Tsakhim Ortoo NGO and the Association of Mongolians in the UK D.Tserenbat attended the meeting through tele-conference. June 14 (gogo.mn) A project opening ceremony was held in May to establish a 8.4 hectares of "Botanical micro garden" at National Amusement Park. Within the frame of this project, reforestation and gardening process is in progress. The project team is working to complete pool, pedestrian and bicycle road, parking and other landscaping works by July. The project team have planned to invite delegations and guests of the 11th ASEM Summit which will take place in Ulaanbaatar on July 15-16. The project is being implemented by $1.5 million investment from "The Asia-Pacific Network for Sustainable Forest Management and Rehabilitation" international NGO and is expected finish by early September. How to spend the summer productively in UB? June 14 (gogo.mn) Are you sick of spending summer hiding at your home? If so, we deliver you the cool and brand new courses information which can help you to spend the summer productively. Try one of them and find your new hobby. June 14 (news.mn) Today, Mongolia's new ambassador to Hungary, Z.Batbayar, presented his credentials to Hungarian President Janos Ader. During the ceremony, the two men spoke to each other in Hungarian. President Ader commented that a high knowledge of language and culture is important for the work of an ambassador. During the meeting, the two shared their views on the upgrade of the Biocombinat, currently underway near Ulaanbaatar and co-operation in education and water sector management. Ambassador Z.Batbayar congratulated the President for being selected as a member of the UN's Water Council and noted that Mongolia and Hungary have good possibilities to co-operate in the area of climate change. The Mongolian Ambassador also expressed his thanks to President Ader for the 200 Mongolian students who are able to study in Hungary each year. The two sides discussed deepening economic relations further in order to strengthen the close "brotherly" relationship between Mongolia and Hungary which goes back over half a century. Ulaanbaatar, June 14 (MONTSAME) Strategy and Research Institute of the National Security Council and the Ministry of Foreign Affairs of Mongolia are organizing the third "Ulaanbaatar Dialogue (UBD)" scientific conference on June 16 and 17 here to bring together 150 delegates from Russia, China, USA, India, South Korea, North Korea, Japan, Germany, France, Australia and Mongolia. The annual scientific conference on the events being held in the margin of the "Ulaanbaatar Dialogue on Northeast Asian Security" initiative by the President Ts.Elbegdorj. At the third meeting, a series of discussions will run among the scholars and researchers on the current situation of security in the Northeast Asia, challenges, actual steps towards building regional understanding and mutual trust, and promoting the regional economic ties. The sides will be exchanging views on the environmental protection and disaster management cooperation for the first time. Having friendly relations with all countries in Northeast Asia, Mongolia is fully capable of making contributions to mastering challenges of the regional security by means of negotiations and diplomatic approaches. In consideration of this, the regional experts are committed to upgrading the Ulaanbaatar Dialogue to the level of independent conference of specialists of the region. It is intended that the representatives of the Defense and Foreign Affairs Ministries would be taking active part in the UBD scientific conferences, in order to mobilize the initiatives of scientists and researchers on the regional level. June 10 (Colorado State University) CSU Professor Maria Fernández-Giménez has received the Order of the Polar Star from the government of Mongolia, the highest civilian honor the country presents to foreign nationals. Fernández-Giménez was selected due to her long-standing commitment to researching Mongolia's extensive rangelands and how natural and human communities are adapting to ecological and economic change. Fernández-Giménez has been researching rangeland systems and the pastoralists they support in Mongolia since the early 1990s, when she was among the first Western scientists to conduct research in Mongolia following the country's transition from communism to a market-based economy. She joins the rarified air of previous recipients including former Secretary of State Hillary Clinton, and Sen. John McCain. According to a decree from President Tsakhiagiin Elbegdorj, Fernández-Giménez received the honor due to her contributions to improving the knowledge of experts concerning animal husbandry in steppe regions, protection of natural resources and capacity-building. "Receiving this award is a tremendous honor," said Fernández-Giménez. "It means that the research and education we have done since 1993 is recognized and appreciated by the Mongolian government and the people of Mongolia. It also demonstrates the continuing importance of rangelands and pastoral livelihoods to the nation." "On a personal level, it is humbling and very meaningful to be nominated for this award by the people with whom I have worked so closely for so many years — Mongolian researchers, students and herders," Fernández-Giménez added. June 14 (gogo.mn) Between 2012 - 2015, 56 new kindergartens were built in the capital city at a cost of 46.2 billion tugrik. Thus kindergarten capacity reached 6785. And UB investment department states 54 new kindergartens with capacity to receive 9705 children will be built in 2016 at a cost of 77.3 billion tugrik. Those kindergartens will be built in accordance to population of districts. Particularly, 11 will be in Bayanzurkh district, 10 in Songinokhairkahn district, 9 in Bayangol, 8 in Khan-Uul, 8 in Chingeltei and Sukhbaatar districts, 2 in Nalaikh and 1 in Baganuur district. June 16 (University of Delaware) Khaliunaa Naranbayar was one of just 250 students chosen this year for a Global Undergraduate Exchange Program (Global UGrad) scholarship, an award which brought her to the University of Delaware for a single semester of study. Naranbayar is a junior at the National University of Mongolia, where she studies international relations. "I've wanted to become a diplomat since I was very young," she said. "My father used to work in the Embassy of Mongolia and I've met so many people around the embassy. I just knew I was going to become one of them because I want to connect my country to other countries." During the spring semester, Naranbayar put her diplomacy skills into practice as she introduced her new friends, peers and the greater Newark community to Mongolian culture. The Global Ugrad Program, sponsored by the U.S. Department of State's Bureau of Educational and Cultural Affairs (ECA) and administered by World Learning, has the overarching goal of promoting mutual understanding between the people of the United States and other countries. "I only had four months here. So, I really wanted to experience U.S. culture and get to know many different people, learn about them and engage myself in the community to experience more," Naranbayar said. "I also wanted to provide people with Mongolian culture, to let them know something about my country at least." In addition to taking courses as a full-time student, Naranbayar was required to complete community service as part of her scholarship. "I don't really think of it as if I had to do it," she commented. "I really wanted to do it because service is one way of really engaging in American culture. It's always nice to be part of a new community, to learn and develop yourself in many new ways." During her time in Delaware, Naranbayar engaged in service-learning opportunities with Lori's Hands and the Delaware Food Bank, participated in the University's Martin Luther King Jr. Day of Service, and became a part of the Student Literacy Council at UD, just to name a few. "Volunteering with Lori's Hands made me realize that there are many who are disadvantaged and need help from others. When I return to my country, I want to help as much as possible and will continue to do community service." Upon her return to Ulaanbaatar this summer, Naranbayar will begin an internship with the United Nations Development Programme (UNDP) and will use her experience at UD to foster awareness among her peers at the National University of Mongolia on programs like Global Ugrad, which allow students from around the world to engage in international education. "I want to let people know how my experience was, how it helped me grow personally and educationally," she said, adding, "Many students in Mongolia now want to study abroad." During Naranbayar's residency, World Learning representative Amy Fisher Bruey visited UD for an introduction to campus, to meet with key University units and to discuss possibilities for hosting additional Global Ugrad students in the future. "I was truly impressed with the University's academic and social offerings for international students on campus," she said. "Khaliuuna had a wonderful experience thanks to all of your preparation." According to Vina Titaley, sponsored student coordinator, "As the first UGRAD fellow on campus, Khaliunaa demonstrated tremendous leadership and independence through her service and academic work. It's always a pleasure to host such great sponsored students like her. We look forward to hosting more Ugrad fellows at UD in the future." June 9 (The Globe and Mail) When Battsengel first grabbed the wheel of his 1999 Toyota Prius, his friends and family mocked him. "You bought the worst car in the world," they said, after he took possession of the little Japanese car six years ago. Nothing about the second-hand hybrid seemed like a fit for Mongolia, a place where just 10 per cent of the roads are paved. The only way to reach most of the country is over grass and dirt tracks that cross tens of thousands of kilometres of steppe and mountain. Then there's the cold: Ulan Bator is the world's most frigid capital, a place that outshivers Moscow and Ottawa. Mongolia, in other words, is Land Cruiser country. Who would want a Prius? Battsengel, who like most Mongolians goes by one name, was worried, too. He picked the Prius for its price – just $2,500 – and fuel economy. But maybe he chose wrong? "I actually thought of replacing it and buying a different car," he said. "It took one month for me to be convinced it's a good car." And no one questions his decision any more – because most of them have come to the same conclusion. Priuses now make up nearly 13 per cent of the passenger vehicles on Mongolian roads, according to government registry statistics, a number that is rising fast. Last year, Mongolians imported 19,494 Priuses, a staggering 52.5 per cent of total vehicle imports, and up from 38 per cent the year before. It's no stretch to call the Prius the unofficial car of Mongolia, making the tiny-wheeled hybrid the unlikely automotive conqueror of the land of Genghis Khan. On the streets, it's common to see flotillas of uninterrupted Priuses, some of them so old – such as Battsengel's – that they were built when the car was sold only in Japan, before its global debut in 2000. Outside the city, too, the diminutive two-wheel-drive picks its way across snow drifts and rock-strewn dirt, navigating the same routes as camels, horses and Soviet-era UAZ jeeps. The reasons for the Prius dominance are partly mundane. Mongolia charges no excise or air pollution tax on hybrids. That makes Priuses cheap, a particular virtue as the country's economy hits a wall. Mongolians have grown so cash-poor some are now offering cows to repay bank loans. Where taxes fall, Priuses thrive – not just in Mongolia. "We hear that there are a large number of used-car hybrid cars, including Prius, in Sri Lanka and Fiji because hybrid vehicles enjoy favourable treatments on tariff in these countries," said Maki Niimi, a spokesman for Toyota. Toyota itself hasn't exactly grown rich off Mongolia: It sells about 10 new Priuses a year. The remainder are bought used. But it's hard to imagine a better vote of confidence in the ruggedness of its green machine than its overwhelming popularity in a place with such harsh conditions. It's not Toyota's doing. "We do not do anything particular on the sales side to promote used-car Prius," Niimi said. The car owes it popularity instead to people such as Luvsansambuu, an importer who last year brought in containers stuffed with 1,800 Priuses, nearly 10 per cent of the total. He sources them from auctions in Japan. He brought his first two Priuses to Mongolia in 2010, making him among the first to gamble on the car. By the following year, the Prius was all he imported. "Priuses sold well, people bought them quickly," he said. Still, it was "a high risk but high demand car," he said. "By high risk I mean that the batteries and the engines could break down – and the cost of repair was high." Rumours abounded about the strange new vehicles. In the cold, some people thought, electric drive components would freeze, requiring replacement of the entire engine. First-time buyers called Luvsansambuu in a panic when their gas engine cut out at traffic lights. "What's happening? What did you sell me?" they asked. "I had to explain that when you stop, the electric part kicks in and it doesn't emit sound. So nothing to worry about." A former Soviet satellite state, Mongolia's roads were once dominated by Russian vehicles, whose ungainly forms still trundle distant grasslands centres. When the Soviet Union collapsed, Korean cars made major inroads. But when mining brought wealth to Mongolia, people went Japanese. In 2011, one survey found that 45 per cent of cars in the capital carried the Toyota's three-oval marque. With popularity has come a radically adjusted image of the value of the Prius – especially in the cold. With its giant battery, it always starts. A diesel Land Cruiser can only dream of performance like that. "People who bought Priuses don't need to worry about a garage, so it's also cost-efficient," Luvsansambuu said. Mine worker Amarsanaa switched from a Land Cruiser to a Prius two years ago. He uses it to cart around his family of six. "It's an easy, light ride," he said. "And it's good for the environment." Ulan Bator now boasts dozens of Prius-only repair shops. They have found flaws. Steering wheel columns and electric cooling pumps break on early models (Toyota has issued recalls for both), and later models have not proven as durable. Drivers criticize the sound insulation and, in Ulan Bator, report real-world fuel economy numbers of seven to nine litres per 100 km, at least 50 per cent worse than what Toyota advertises. Rear shock absorbers give out, and batteries don't last more than 10 years, far less if the car isn't driven regularly (Toyota warranties new batteries for five years). "It would be better if they improved the battery life," says Batbold, who bought his first Prius in 2010 and opened a repair shop a year later. "In Mongolia, you have so many older models which have been running for many years. The common problem is the battery." Between himself, his brothers and his cousins, the family owns six Prius repair businesses. "In terms of cost, I would definitely recommend Mongolians buy a Prius," he said. "But in terms of reliability, it depends on the age of the car." As for Luvsansambuu, the importer, he drives a Land Cruiser Prado. "People who buy Priuses are doing so purely for transportation purposes," he said. "People who want to make a statement or show others that they are successful buy Lexuses or big SUVs." June 14 (Foreign Policy) Delivering the mail in rural Mongolia is no easy feat. About 30 percent of the population is still nomadic and the country is among the world's least densely populated. Many Mongolians are forced to collect their mail from a post office box, often far from their homes, while others have no access to deliveries at all. For the packages that do make their way across the steppe, postmen have to rely on local knowledge to navigate the vast swathes of the country that lack actual roads. A London-based startup is hoping to change all that — one three-word combination at a time. The company is called What3Words and they've developed an app that records GPS coordinates to nine-square-meter plots and simplifies them into a three-word combinations to mark a specific location a map. The Mongol Post, the country's national mail service, announced in May that it would be switching to the system, which is set to come into effect on August 1. The change is viewed as an efficient and cost-effective way to improve Mongolia's postal problems in rural areas and in the capital Ulaanbaatar, where many streets don't have names and many residents live in makeshift housing without a designated address. Putting in a sophisticated new street addressing system is a major endeavor that can require millions of dollars worth of investment and decades to put in place. In adopting What3Words' three-word technique, Mongolian officials are hoping to save time and money by going completely digital, Giles Rhys Jones, marketing director at What3Words, told Foreign Policy. "They saw this as a way to leapfrog into the new era of addressing," said Jones. The basis of the new system is that a trio of words is easier to remember than a series of numbers that make up GPS coordinates, with each unique word combination corresponding to a specific 9-square-meter spot on the map. This universal addressing system works by breaking the world into 57 trillion squares and assigning each one a three-word combination. For instance, Ulaanbaatar's Chinggis Khaan International Airport becomes loans.lives.breached; or Paris' Eiffel Tower becomes prices.slippery.traps using What3Words system. The combinations are randomly assigned and have been refined to avoid homophones or offensive terms, with short terms reserved for the most populated areas of the world. Moreover, the app can be used without a cellular or data connection on a mobile phone, making it ideal for Mongolia and other rural areas. The plan is for What3words to be integrated across Mongol Post's internal systems, with postal workers using the new form of addressing to navigate directly to the square, wherever it may be, and find the customer's front door. 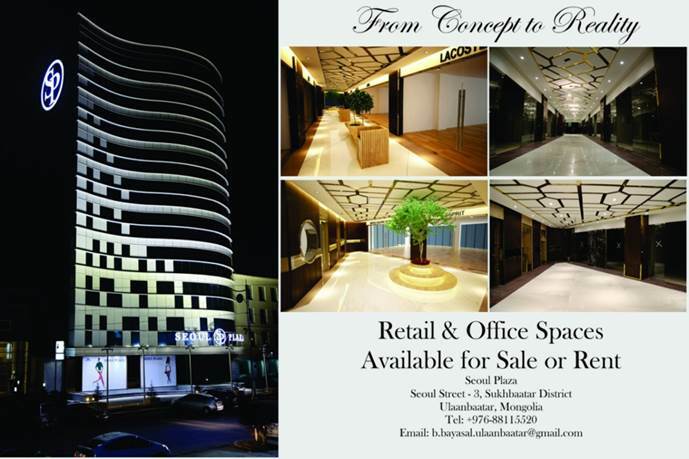 The company hopes Mongolia will be just the start. What3Words is also currently being used by NGOs in Tanzania to track cholera outbreaks and provide malaria drugs to difficult to reach communities. Moreover, residents in the Rocinha favela in Rio de Janeiro, one of the world's largest slums, started using What3Words' system in 2015 to deliver packages within the densely populated area. Successful pilots could be good news for the roughly four billion people in the world that have no address for mailing purposes, leaving them unable to establish a legal identity, according to the U.N. Development Program. Rapid economic growth in the developing world could send those numbers higher, with the swelling populations of major cities increasing the number of people living in informal settlements. In Mongolia, the change from referring to locations with house numbers and street names to word combinations could have a big impact beyond people receiving their mail, it could also improve the lives of many Mongolians. "We're trying to democratize addressing. Whether you live in a house, a tent, or an R.V., you now have a way to describe where you live," Jones said. "An address allows you to vote, open a bank account, and access government services. Without one you're invisible." Beyond connecting residents to the wider world, the creation of a national addressing system is vital for allowing governments to collect taxes efficiently and for helping businesses target new markets, according to the U.N.'s Universal Postal Union. And while Mongolians are trailblazers in using What3Words' system for state-run mail delivery, many organizations have found other uses for the British startup, including navigation apps, courier companies, and even the United Nations, which used the company's system to develop a free to use rapid response disaster relief app. Ulaanbaatar, June 14 (MONTSAME) An exhibition named "Mongolian Heritage – Mongolian Bow in 3,000 years", showcasing the history of Mongolian archery has opened at the National History Museum, to close on June 20. The exhibition is composed of rare and precious artifacts being conserved in the museum, dating back to the period between the Stone Age and the 19th Century, as well as the fresh collections of Excellent Archers of Mongolia Ts.Khuderchuluun and J.Battomor. Their private collections boast more than 300 items. June 9 (University of Oregon) Professor Emerita Esther Jacobson-Tepfer of the Department of the History of Art and Architecture has been awarded the Kublai Khan Gold Medal, the highest honor offered by the Mongolian Academy of Sciences, and a Presidential Citation in recognition of her work on the preservation of Mongolia's cultural heritage. The awards were presented at the international conference "Rock Art: History, Memory, and Dialogue" on May 30-31 under the auspices of the President of Mongolia and UNESCO. The medal was presented to Professor Jacobson-Tepfer by Dr. Dorj Regdel from the Academy. An Asian art historian and the Maude I. Kerns Professor Emerita of Asian Art at the UO, Jacobson-Tepfer began field research in Mongolia's Altai Mountains in 1994. "Our projects involved the identification and documentation of rock art and other surface monuments," explains Jacobson-Tepfer. "In the second project, we undertook to record this material with detailed mapping of a largely unmapped area." The award from the Mongolian Academy of Sciences was in recognition of her efforts to preserve Mongolia's cultural heritage. In addition to her original work on Altai rock art, Jacobson-Tepfer collaborated over a period of several years with the Mongolian government on the successful nomination of two large UNESCO World Heritage Sites: the petroglyphic complexes of the Mongolian Altai (2011) and the Burkhan Khaldun Mountain and surrounding sacred landscape (2015). Her first project involved collaborations with Russian and Mongolian colleagues. The second phase of the project involved James Meacham, Director of the University's InfoGraphics Lab, and Gary Tepfer, photographer. Professor Jacobson-Tepfer has published many refereed articles and eight books. Her book Archaeology and Landscape in the Mongolian Altai: an Atlas, produced with James Meacham and Gary Tepfer was awarded the 2010 Globe Book Prize by the Association of American Geographers, and received a CaGIS Honorable Mention for the best atlas published that year. June 12 (PNA) About 15 Mongolians involved in Artisanal Small-Scale Mining (ASSM) visited South Cotabato over the weekend to learn first-hand the "best practices" of the thriving small-scale gold mining industry in the province of South Cotabato, officials said here Saturday. Speaking during a news conference at the South Cotabato provincial capitol, Provincial Environment and Management office (PEMO) chief Siegfred Flaviano said NGO BAN Toxics, PEMO partner in its province-wide campaign for Mercury-free mining, accompanied the Mongolians in their tour. "They were impressed how the province managed the small mining activities and they would like to emulate it," Flaviano said in Filipino. To show effective PEMO practices to ensure environment-friendly mining activities, he presented to visiting Mongolian miners the "Galing Pook-awarded Minahang Bayanihan" Program of the province through an audio-visual presentation which was translated by the group's interpreter. Cesar Sulit, South Cotabato Provincial Tourism Officer, welcomed the Mongolian delegation and presented them South Cotabato's tourism programs. After meeting with South Cotabato Gov. Daisy Avance Fuentes, BAN Toxics toured the group to a Mercury-Free Ball Mill facility in Poblacion, T'boli to witness first-hand the processing of concentrated gold ore using borax. The Mongolians also visited the mining site in Kematu, T'boli and the province's summer capital Lake Sebu. Through and interpreter, the Mongolians lauded the provincial government program and declared what they have learned here will be emulated back home. June 10 (Ramona Sentinel) Ramona photographer Michael J. Hennig will present 2Create Gallery's first exhibit: "Mongolia." Hennig took the photographs during his work with National Geographic and Waitt Institute for Discovery Archeological Expedition in Mongolia. His primary role was operating unmanned aerial vehicles (UAVs) to acquire aerial imagery of regions of significant archaeological interest. Because of his background in photojournalism, he also became the expedition's photographer. Opening night for the exhibit will be on Saturday, June 11, at 6 p.m., when the public is invited to talk with Hennig and enjoy refreshments in the gallery at 438 Main St. The exhibit will be displayed for a month and a half. Ulaanbaatar, June 14 (MONTSAME) Athletes from the Mongolian Intellectual Academy coached by B.Baasandorj successfully competed in an international open tournament for mind sports held last weekend in Penang, Malaysia. This tournament was attended by 97 athletes of eight countries, who competed in ten kinds of mind contests in three age categories. The Mongolian team captured 22 medals. Among the athletes, B.Bat-Erdene set the world new record in the "Abstract images" contest in the children's division, while B.Shijir-Erdene IM won the competitions with most points in the junior category. In last five years, Mongolian mind athletes collected 504 medals from World Championships and other biggest international tournaments. Five athletes and their coach are having training now for taking part in the Extreme Memory Tournament of top 24 athletes of the world, which will be held on June 24-26 in San Diego, USA. June 14 (news.mn) Only one month remains until the annual Naadam festival. This year, preparation for Mongolia's summer celebration of the traditional sports of archery, wrestling and horse racing has been overshadowed by the parliamentary election and ASEM. Nevertheless, planning is going ahead at full steam; recently the Naadam organization committee has held three meetings. One of the main activities already underway is the repair program at the Khui Doloon Khudag and Central Stadium. This year, a total of 1024 wrestlers will participate in Naadam in ten stages. This means that the wrestling is likely to run later into the evening; therefore, the Central Stadium is to increase the lighting. June 14 (news.mn) United World Wrestling has announced the names of the 50 judges who will participate in the Rio Olympics. The list includes a Mongolian, B.Tumurbaatar, who is an international Olympic-level judge. This means that B.Tumurbaatar becomes the second official Rio-2016 judge from Mongolia. Last month, M.Bukhbat was appointed as a judo judge to work with the other judges from 14 countries in Rio. June 14 (news.mn) The Freestyle Wrestling World Cup ended yesterday in Los-Angeles. The Mongolian team which has been participating in this international competition for male wrestlers has been placed in 6th place. On Sunday, the Mongolian team beat the Turkish team by 6:2 but went on to lose to Russian team by 2:6. In the morning, the Mongolian and Georgian teams were equal (4:4); unfortunately, as things progressed this changed and Georgia triumphed. Subsequently, Mongolia faced the team from Azerbaijan for the 5th place but came in 6th place with the score of 3:5. Last year, Mongolia also came in 6th place. June 14 (Daily Mail) The Mongolian pioneers, led by a romantic Buddhist called Enebish Ganbat, brought sparkle to Royal Ascot but got only one of their wishes. They managed to meet the Queen. A great admirer of the human form, only last week Ganbat went to pick flowers for a woman he smittenly described as the most perfect he had set eyes upon. It might have been impertinent to go that far with the Sovereign. He merely called her, respectfully, a very beautiful lady. Ganbat was here with his friends in the parade ring wearing their traditional dress of a deel (tunic), elaborate belts, brocade hats and welly-like shoes that are designed to be worn on either foot. Ganbat, born in Mongolia but now living in America, did not fulfil his dream in the King's Stand Stakes, a five-furlong sprint in which the horse he trains, Mongolian Saturday, started at 16-1. So enamoured is Ganbat with his charge, the 20-1 winner of October's Breeders' Cup Turf Sprint, that he called him 'Champion' from the moment he won his first race by 10 lengths. Not that the Mongolian intervention was entirely futile, given that they are trying to put their homeland's opening market on the world map. Accompanying Ganbat was owner Ganbaatar Dagvadorj, the younger of two brothers who made their fortune in the early Eighties (Mogi: 90s I'm sure) when Soviet communism faded out. They started out selling furs on the black market, ran fast-food franchises and now own a business conglomerate called Max Group. And here they are exporting Mongolian horsemanship that goes back to when Genghis Khan was criss-crossing the Steppes. But while their dreams must await fulfilment, there was joy in the Queen Anne Stakes for American project Tepin, owned by Robert Materson of California, trained by Mark Casse, and ridden by Julien Leparoux, a 32-year-old Frenchman having his first ride in Europe after moving to America to find success. Indeed, none of that triumvirate had participated at Royal Ascot prior to this week's opening race on the rain-sodden ground. Tepin runs on drugs in America, where Lasix — a diuretic — is a permitted race-day medication. Here it is not and to win on a straight mile, alien to US thoroughbreds which race exclusively on left-handed ovals, and bravely holding off a late challenge from Belardo by half a length represented a worthwhile trip across the Atlantic. Casse said: 'She is a great horse and she showed her greatness today. But, fear not, we have not seen the last of that old charmer Ganbat. He and 'Champion' will take part in the Diamond Jubilee Stakes on Saturday and the July Cup at Newmarket. June 13 (VICE) How many hours have we all spent staring blankly at our computer screens, fantasising about a new, adventure-laden life away from the office and our too-small room in a stressful house-share? Enough hours that they turn to days, and then to months, until you realise that you've been looking at the same screen for seven years and the closest you've come to "shaking things up" was getting a last minute Eurostar to Lille. More often than not, it takes something serious – something potentially life-threatening – to make you sit up, shut down the computer and finally do that thing you've been saying you'll do since forever. For 24-year-old Felix Mantz, that something was a collapsed lung. It forced Felix to re-evaluate his life and made him realise that he had to make the most of the now and stop thinking so much about The Future. Most people might decide to jump on a plane and go somewhere hot to relax after suffering a collapsed lung. Not Felix. After recovering at home, he signed up for the gruelling Mongol Rally: a car "race" that starts in London and ends in Mongolia. Participants can take any route they wish and as much time as they like. The one stipulation? The car has to be as close to failing its MOT as possible. Over six weeks, Felix and a friend travelled 17,000km through 17 countries. June 14 (gogo.mn) A Sound live band, which was established 10 years ago, will perform Yesterday live concert on June 17 at 7:30 at Ulaanbaatar ensemble. A Sound will play the best and hit songs of The Beatles with symphony orchestra. Pianists T.Purevsukh and Oyuka produced the songs while D.Nyamdash is working as a conductor. Tickets are available at the www.ticket.mn and 1900-1800. June 14 (gogo.mn) Mongolian contortionists started their preparation to set the Guinness World Records. 350 contortionists will perform on Aug 6 at Chinggis square, having set a goal to challenge it to the Guinness World Records. June 10 (Kazakh TV) A wandering iron horse paid a visit to Kazakhstan. Metal sculpture weighing 600 kilograms arrived to the country from Holland. Two travelers, Bart Somers and Bert Geeraets set a goal to travel from the Netherlands to Mongolia in two months. On the way they stopped and learned about the cultures and peoples of different countries. Together, they have already passed 9,500 kilometers and visited eight countries. After we arrived from the ferry at the Caspian sea, the new was is that it is a horse-country, Kazakhstan is a horse-country, Mongolia is a horse-country, so the horse is the catalyst for all these encounters. So, this is the purpose of the project – it is a travelling art project. It is not a static art, it is a travelling art. This horse is not only a piece of art but also a social project. A crowd funding platform was organized to create the sculpture. All the money raised was spent to support young jobless people. They have helped in making the traveler's and artist's Bart metal. Now, the 'Steel Express', as the project authors name it, is on the finish line. After Kazakhstan, the Dutch will travel to Russia and then to Mongolia. I like making a movie, the landscapes are so beautiful and for me it is also a challenge to make a nice pictures of a different landscapes and also different people. When one of us is driving and another one is sitting on the passenger seat, you look at rear mirror and you see people looking at the horse, pointing at it, laughing, and it is a real joy. June 10 (Jeju Weekly) Founders of Jeju's Olle trails - the island's network of coastal walkways - are set to launch a new route in Mongolia. Olle Trail Foundation and the Jeju Tourism Organization (JTO) are poised to sign a deal with the government of Ulaanbaatar, the Mongolian capital, on June 16. JTO chief Choi Kab-yeol and Olle Trail Foundation head Suh Myung-sook signed a business pact for development of the Mongolian Olle Trail on June 8. As part of the agreement, the Foundation will plan a series of courses in the landlocked East Asian state. It will manage the route with the JTO, which will be responsible for raising funds. The plan is part of a deal between Mongolia and Jeju to boost tourism and cultural exchanges. Since construction of the Olle paths began in 2006, the Foundation has developed 422kms of its walkways along the island's coastline. The Mongolian Olle is set to open in the first half of 2017. It will be the first time an Olle has been developed outside of Jeju.